When it started becoming clear just how serious the financial crisis was going to be – when access to credit started shrinking, when the orders started disappearing and the payrolls started thinning – coverage of developments in industry were all lean manufacturing all the time. It was “streamlined this” and “automated that.” Lean, lean, lean. If the message started sounding redundant, that’s because it was. But it also seemed to reflect reality.  In 2006, according to the U.S. Census Bureau’s Annual Survey of Manufacturers, there were just under 13 million peopled employed in manufacturing jobs, and the total value of all of the shipped manufactured products from that year topped $5 trillion. By the time the figures for 2009 had been released, which was at the height of the financial crisis, the value of shipped products fell by more than $500 billion, and the number of people employed in manufacturing jobs fell beneath 11 million. A recovery in the manufacturing sector would have to involve some adaptations to the new realities of the global economy. Lean manufacturing is an intuitive solution to the problem of cost management. During the financial crisis, revenues were decreasing because of decreasing levels of national and global economic activity, and the cost of business was increasing because of tightened access to credit. Manufacturers didn’t have control over either of those variables, so they turned their attention to costs that they could control: personnel, equipment and waste caused by accidents or inefficiency, among other costs. There are many ways to approach managing and reducing these costs, and one of them is by automating production. 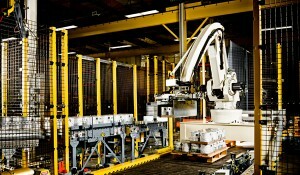 The robotic palletizer is a great example of an automation technology that can help a company manage costs. Robotic palletizer image courtesy of Columbia Machine, Inc.
A robotic palletizer is what it sounds like – a robot that places things on a pallet. Pallets are flat, usually square surfaces that are manufactured to include hollows that can be accessed by the forks of a fork lift. At the end of a manufacturing process, finished products are placed on pallets so they can be moved by forklifts to their trucks, shipping crates or other transport and shipped easily to their destination. It’s obvious why palletizing is an important part of the manufacturing processes in which it is involved. It has to happen before products can be shipped. If it’s done correctly, the stacked, palletized products will arrive at their destinations safely. If the products are stacked incorrectly, the products can shift in transit, causing damage to nearby objects or people or becoming damaged themselves. Palletizer image courtesy of Mollers North America, Inc.
Palletizing is a repetitive, monotonous task that people aren’t always well-suited for. This can be true especially in situations where the palletized objects are very large or heavy. The kinds of repetitive motions involved in stacking those objects could quickly take a toll on human workers. Also, if a worker were to incorrectly place an object, there could be consequences that could disrupt production or even cause product loss. 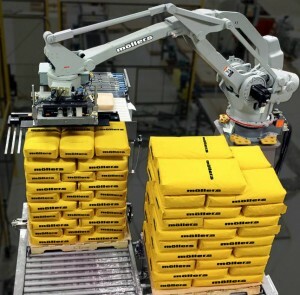 Automatic palletizers are capable of rapidly and precisely palletizing and de-palletizing objects over and over without becoming fatigued. What does this mean for the companies that employ them? It can mean savings and increased output. The savings come from a number of places. First, palletizers can work largely unsupervised (though a small technical or supervisory staff can be necessary under some circumstances). This means that labor costs can be reduced. Also, because palletizers are less likely to make mistakes than human workers, the chances that products will be dropped, spilled, improperly loaded or otherwise mishandled are lower. This means that there’s less of an opportunity for product loss, which reduces overall waste. Then there’s increased output. Palletizers are capable of stacking and moving materials much more quickly than manual laborers, which means that larger numbers of loaded pallets can be made ready for shipment in shorter amounts of time. There are signs that American manufacturing is beginning to recover. Sales are increasing, and jobs seem to be materializing again. But it’s clear that the road to recovery for the manufacturing sector is long, and progress so far has been tepid. But progress is progress, and the steps that industry is making to become leaner and less wasteful may be contributing to that progress. Palletizers and other automation technologies will play an important role in making manufacturing stronger.